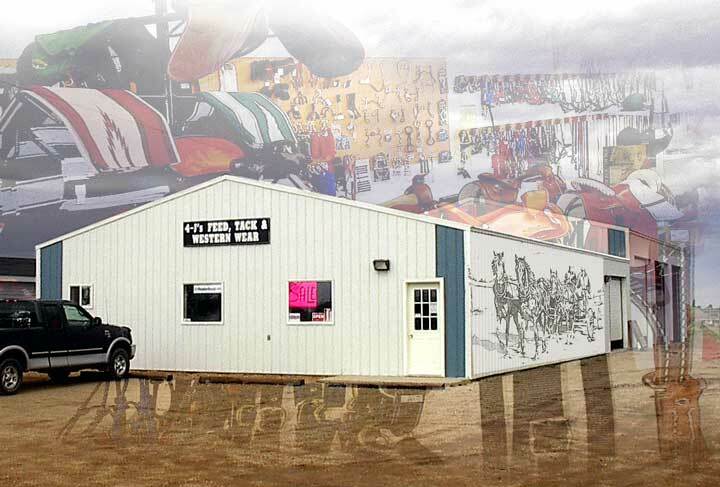 It was back in June that 4-Js Feed Tack and Western Wear moved from its old location at the livestock auction centre to its new site across the road from Schapansky's Auction. The new setting has allowed the business to expand its product line and offer new services to its customers which are more increasingly to be coming to Tisdale from a wider and wider area. The original product line had been tack and livestock handling gear but with more room and warehouse facilities the feed business has truly become the mainstay of the business. for their livestock is greatly reduced. Chronic wasting disease and BSE have really upset the agricultural community not only threatening some operations but pushing many to the brink of extinction. Even before the BSE problem arose Canadian animal feed producers had taken serious measures to make their products safer and eliminate possible hazards. Now there are new regulations in place with serious lot numbers and feed manufacturers coming under extremely close scrutiny. 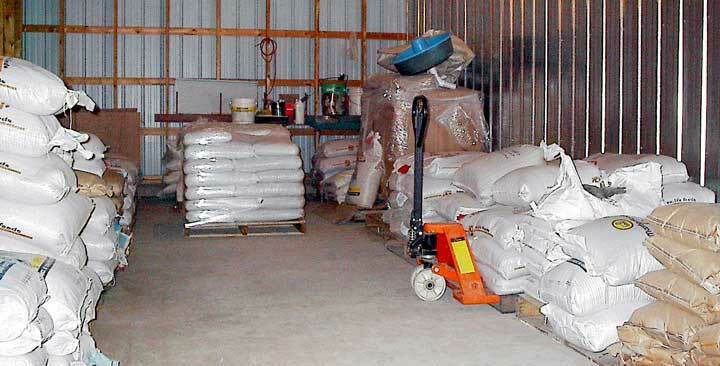 One example is that feed purchased can not be returned and placed back in stock, once it goes to the farm it is no longer available for use elsewhere. On the right is a QuickTime VR panorama of the inside of this newly moved business. If you do not have the latest version of QuickTime download it and install it to give your computer a greater capability. 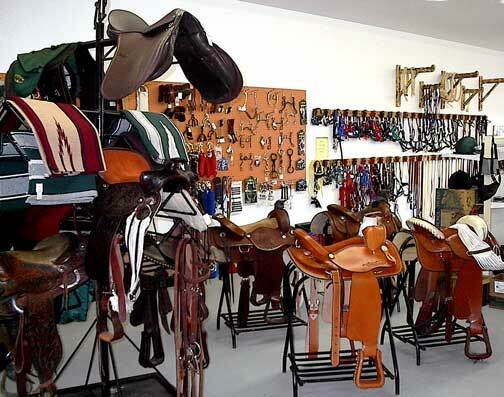 The store now carries a complete line of riding gear for formal equestrian work like helmets and all the other supplies that are part of this sport. The store is now carrying a lot of local art work created around the theme of Canada's western horse culture with some examples shown below. 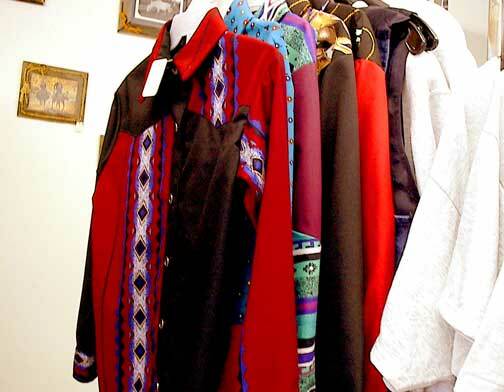 One of the services that is unique to this outlet is the production of custom made and in this store made western clothing. The shirts shown below are each one of a kind and made with outstanding material. In a world where individual style and the need to be unique custom made and locally made products have a powerful appeal. 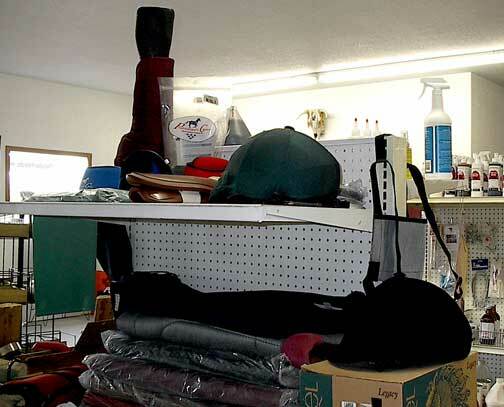 4Js Feed Tack & Western Wear is also moving into harness repair. 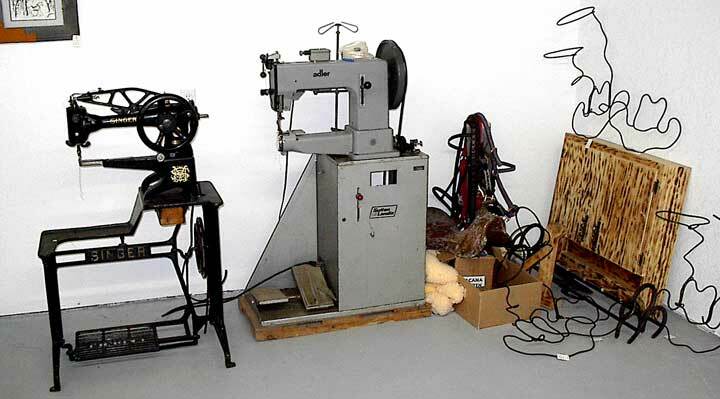 Once we had shoe makers in every community who could patch up harness but those days are gone and this business is expanding this service as they are setting up a workshop to handle the needs of their customers. Not only is there a need for harness repair there is also a need for specialty items to be made that suit the specific needs of the customer so this new service looks like it will be of great use to those people who are making use of harness for sport and as part of their lives. 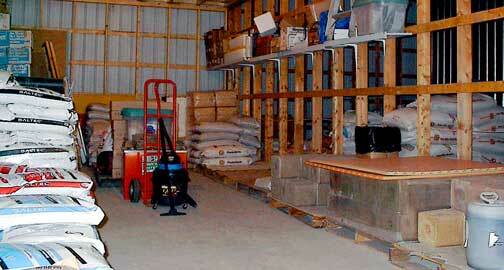 The warehouse facility is rapidly expanding and under development so that a greater volume of product can be handled. 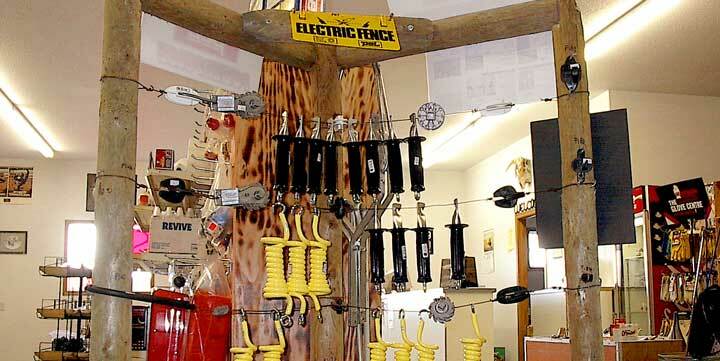 This store relies upon products produced in Regina and Calgary and as mentioned earlier enormous energy is now being given to seeing that quality and safety of the product is assured. Customers are very concerned and determined not to have their herd or their animals endangered by the food they eat.